What can we say about this shoot? If we were only allowed three words, they’d be ‘We love it’! However there is no such restriction so forgive us for going on about it, but it simply was such an amazing shoot to work on. We were asked to be part of it by Bergdorf and Green who specialise in styling shoots at venues around London. This is what the B&G girls said about the shoot and its contributors along with some of the beautiful images taken by Maria de Faci. 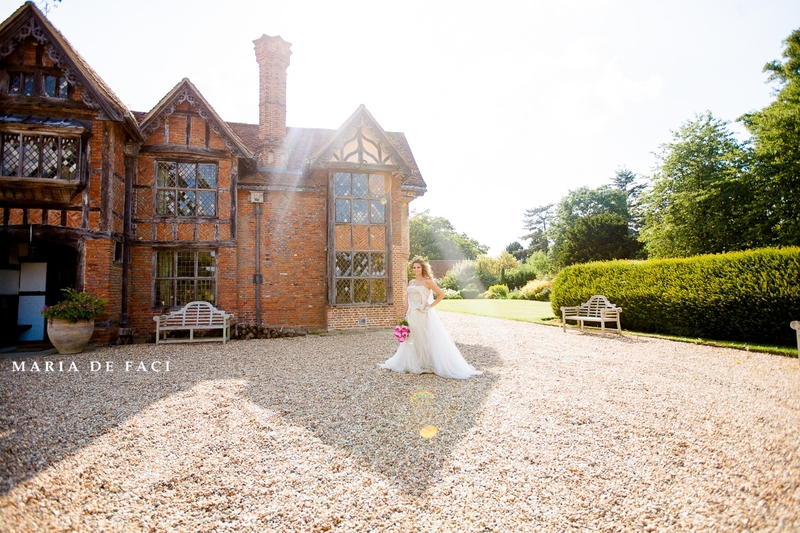 ‘Dorney Court is a stunning new wedding venue. Widely regarded as one of the most beautiful Tudor Manor Houses, the owners (who’ve had it in their family for over 500 years-lucky them!) have opened up their family house and we are so pleased that they have. Fairy tale gabled roofs, landscaped gardens and charming 12th Century church (maybe a tipi? ), it’s all there. 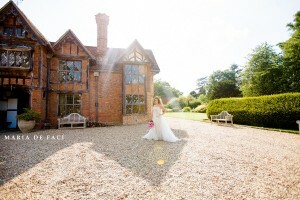 Your entire wedding day can take place on the estate, from the ceremony to late night partying in the Coach House Barn. The venue is run by Absolute Taste, an amazing catering company who will look after your every need. Fiona, the wedding lady for Dorney Court spent the day with us on our shoot and we’d very happily hand our wedding plans over to her hugely capable hands. The food is pretty delicious too. Absolute Taste are the caterers for the Mclaren Mercedes F1 team amongst other fabulous clients and venues so they are very well versed in what makes for a delicious and memorable day. 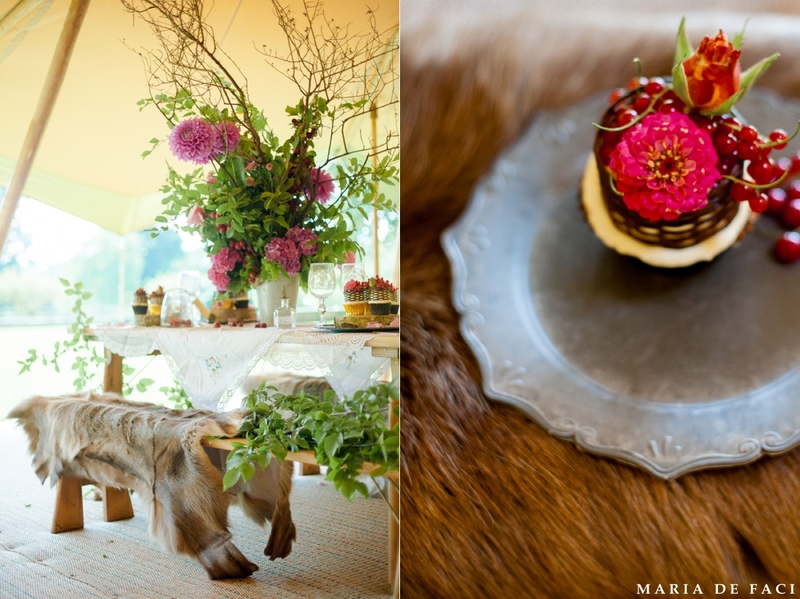 We decided to style the Dorney Court photo shoot with a Scandi boho chic vibe. Outdoors, natural, earthy and a tad medieval. The backdrop of Dorney Court is so beautiful that we wanted to make sure we had this as a focus with the addition of a really amazing Tipi tent from Stunning Tents. When we were told we could have reindeer skins I could have kissed them-talk about Scandi chic! 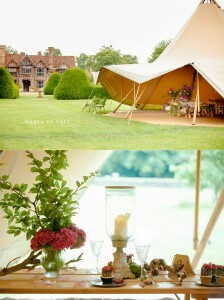 The team at Stunning Tents are really lovely. The Giant Hat which we chose for the shoot has solid wooden poles and a light tan-coloured canvas which was perfect for our relaxed, natural outdoor shoot. It can be dressed up or kept simple but either way has huge wow factor especially set with Dorney Court as the backdrop. Totally the opposite of a ‘white box’ marquee in our opinion especially with the subject of our obsession-reindeer skins! Bergdorf Flowers of Copenhagen were responsible for the beautiful floral, moss, crab apple extravaganzas. 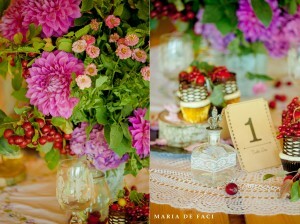 Wild, woody, boho banquet are how Katja described her creations and we agree. Bergdorf”s are well known in the wedding world for creating stunning arrangements with inspiration taken from Katja’s childhood growing up in Denmark. Vivienne Westwood is a big fan and we can certainly see why! Medieval banquet cupcakes were the order of the day for Cakes by Robin overflowing with delicious rustic fresh fruit in a chocolate nest. We are totally salivating! The dresses chosen for this shoot were from a fantastic designer called Angelina Collarusso. With a shop in Richmond, SW London, Angelina is well known for her breathtaking couture designs. On shoots we often mix designs from a number of designers but Angelina’s work was so perfect for the look of the shoot that they are all hers-thanks Angelina! We’ve been in love with Emmy Shoes for an embarrassing length of time so we were so pleased that she was able to feature in our shoot. These little numbers are so pretty. The chic bejewelled strap set asymetrically across the foot is super flattering and we’ll be sporting these at our next wedding for sure. Emily London Hats has made hats for the rich, famous and royalty so we were pretty pleased that she designed some fabulous pieces for our shoot at Dorney Court. 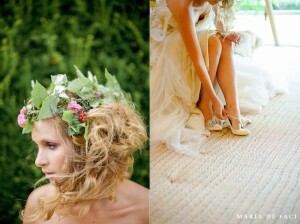 A beautiful straw hat was our fav as well as a dried flower adorned veil. Beautiful!